* Black Finish Designed to work with the factory computer and no additional tuning  BBK s latest cold air intake kits for the popular 2005-2010 V-6 Ford Mustang delivers BIG bang for the buck. Testing on dozens of stock 2005-2010 Ford Mustang V-6 models has shown consistent gains of 20 RWHP & 20 RWTQ with the stock computer program and no other add-ons. This compares to the 8-9 horsepower BBK engineers noted with other manufacturer's units which cost 2-3x more and require the use of an expensive power programmer! This high level of performance with the stock program is achieved by combining one of BBK's famous high flow, lifetime reusable air filters with a show quality black finished steel inlet tube which utilizes a custom mass air sensor adapter that is CNC machined to integrate onto the tube with seamless perfection. 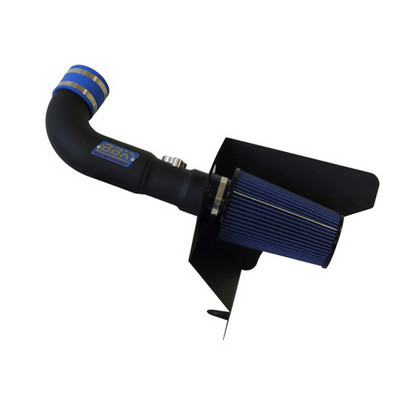 Designed to install in about 15 minutes with simple hand tools, this BBK cold air intake kit delivers! Each BBK Cold Air Intake model has been designed and dyno tested at the BBK headquarters in Southern California to maximize performance. Please note: Part #1737: 50 State legal - CARB D-245-14 on all 2005-2008 Ford Mustang 4.0L Click Here for Instructions No one else can Stack up to the bold clean styling of our aftermarket Billet / Stainless Steel Dress Ups, Street / Strip / Racing Suspension and Performance Parts for your American Muscle Car! Fits these Vehicles: 2005 2006 2007 2008 2009 2010 V6 4.0L Mustang Steeda Roush & Saleen Vehicles.